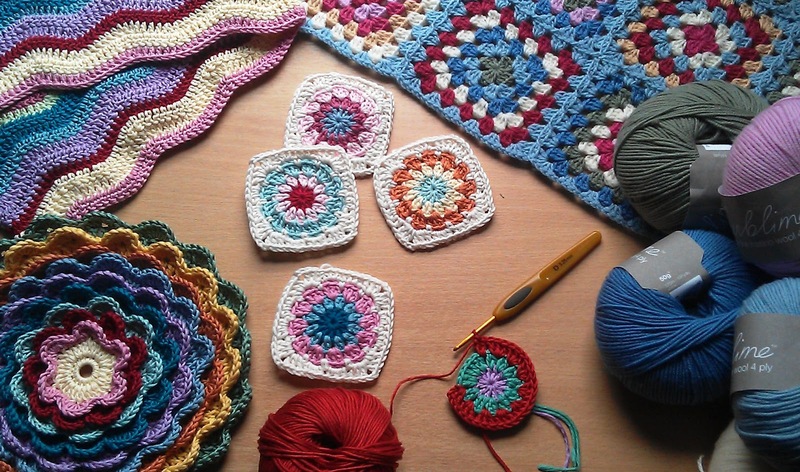 Thanks to the wonderful people over in the We Love Lucy group on Ravelry I finally have a blog. I couldn't wait to get started last night but there's a problem - my camera is broken! I'm getting a new one soon but in the mean time I wanted to share some of my current WIPs with you all. Sorry for the poor quality - I had to take it on my phone. In the top left corner is my Ripple blanket, top right is my Cath Kidston inspired granny square blanket, bottom left is my Blooming Flower cushion and in the middle are a few squares of my own design that will probably end up as a cushion. I have lots of plans for this blog including yarn reviews and free tutorials. I have a few techniques I want to share with you such as the alternative JAYG (join as you go) method that creates a beautiful twisted seam for granny squares that you can see in the photo. So if this has tickled your fancy, please follow me. I'm really grateful for all your support. Great start near neighbour :) I am half way through my ripple blanket I started 2 weeks ago.....love love love it! Can't wait to read more posts..and hopefully you will inspire me to get my blog going that is for me and not work!! I put you on my list of blogs that I follow last night. Everytime you post you will show up on my blog roll. And here you showed up with your first post. Congratulations. I love the photos of the things you have made already. Looking forward to reading what you are up to...!